Do you often ask yourself... Can i afford a beautiful In-Ground Swimming Pool? Well we have the answer. Yes! Vinyl Swimming pools have been around for ages. We have searched through hundreds of manufacturers to get you low cost pricing with outstanding warranties. Our vinyl swimming pool packages are care free for any homeowner. Our choice in whether to construct a polymer or steel wall pool has been made simple through our renovation department. Polymer pool wall panels simply have a great lifetime warranty and don't have the rust factor that a steel wall pool is known for. Many times a homeowner will have a liner replacement issue on an older vinyl pool. When we change the liner the problem is then known. It's a steel wall pool. Fact: Steel wall panels begin rusting immediately when they are installed. Sometimes when they are delivered, they already show the stress that mother natures humidity and rain have forecasted upon them. They come with an oil coating to prevent the rust, however once installed they have rain water going through the ground and contacting the outer side on the wall which is speeding up the rust process, since the dirt that is backfilled around them stays moist, and there is a sweating process that happens on the inside of the wall, due to the climate changes with the pool water and panel temperature. So in essence, you are getting double rusting on a steel wall pool. Yes they claim that they use the same type of steel that bridges are built with, However, its not the same thickness, and it certainly doesn't mean a bridge isn't rusting every day! Vinyl Liner pools are also more cost effective when you schedule to change a liner, as opposed to re-plastering and changing tile on a concrete pool. 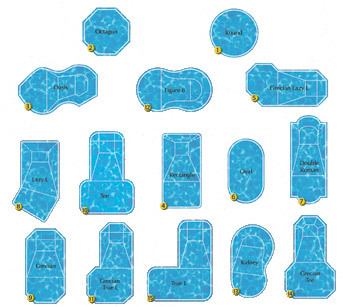 They come in a variety of shapes and sizes, and we can customize the panel layouts to fit shapes and sizes that you have already picked out. There are numerous liner selections and thicknesses that you have available as well. As with a concrete pool we have the ability to customize the depths of the pool without adding extra costs that may not fit your budget.